We are pleased to announce that our final publication for the first COLLABORATIVE COMMUNITY DESIGN INITIATIVE focused on corridors is here. 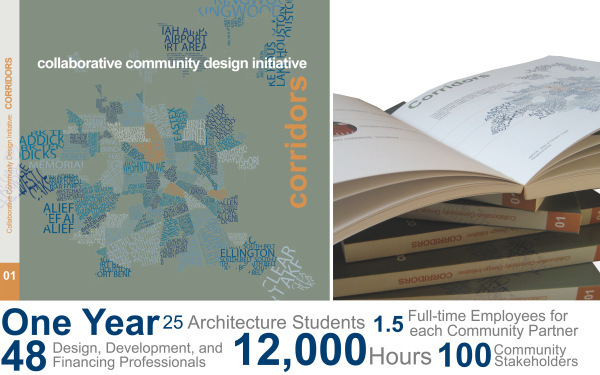 The book documents our year long partnership with four communities in Houston (Independence Heights, Third Ward, Harrisburg, and Greater Heights) and includes contributions from 25 architecture students, 2 faculty, 48 design, real estate, and planning professionals, 10 elected officials or their representatives, and over 100 community leaders and stakeholders. The effort amounted to over 12,000 in-kind service hours to our community partners, the equivalent of 1.5 full-time employees for each community. The project was funded by generous grants from the National Endowment for the Arts, the Urban Land Institute, and Capital One, with additional support from Greater Houston LISC, ULI Houston District Council, the Southeast Houston Community Development Corporation, and the Gerald D. Hines College of Architecture. We thank everyone for their support. We are excited to begin planning our second Collaborative Community Design Initiative, which will focus on our multi-family communities that have experienced profound demographic change. PROJECT TEAM: Project Directors: Susan Rogers and Rafael Longoria; CDRC Research Assistants: Maria Oran, Natasha Ostaszewski, and Jay Taylor; Student Teams: Eric Arnold, Johanna Brustmeyer, Jessica Barnett, Miriam Cardenas, Ethan Dehaini, Kiza Forgie, Lianka Gallegos, Aaron Grant, Christopher Hopkins, Mireille Kameni, Ran Li, Jenna McPhail, Robert Mercado, Amanda Neve, Maria Oran, Allison Parrott, Stefano Poisl, Jennifer Reyes, Matthew Rose, Mauricio Suarez, Xiaowen Shi, Ruqiya Imtiaz-Uddin, Sanja Zilic; LISC Houston: Amanda Timm and Paul Wright; and ULI Houston: Gary Altergott and Ann Taylor.